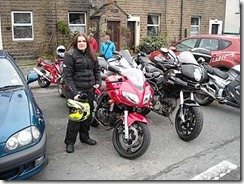 Myself and Helen went on a rideout to Hawes with some of the ladies from the Lancs region of Nukb. Ali was leading and had organised the run. We meet up with Ali and the rest of the ladies and Mark at Clitheroe segcies at 11:30pm. We then preceeded by the usual route of Gisburn, Long Preston to Settle, where we stopped for a brew and a bacon butty at the Singin Kettle. Due to the bridge being closed for strenghting work at Horton in Ribblesdale, we had to divert via Ingleton to get to Hawes. The roads where a bit damp so they curbed my enjoyment on the way to Hawes a bit. 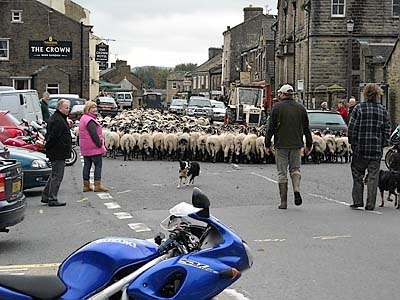 We stopped at Hawes for a brew and cake, while we where at the cafe a farmer brought his large flock of sheep through the centre of Hawes. Something you don't see everyday, well certainly not round Manchester anyway. Then we headed over to Devils Bridge where we found the rain. Myself and Helen then spilt up from the rest of the group and headed home via Stocks Reservoir over Burn Moor. Then via Slaidburn, Clitheroe, Sabden, Simonstone and then dropped on the motorway back home. The new screen certainly got a battering with the wind and rain today. It held up really well and seems to block the wind from my head, time will only tell if it stops the flies on the visor.